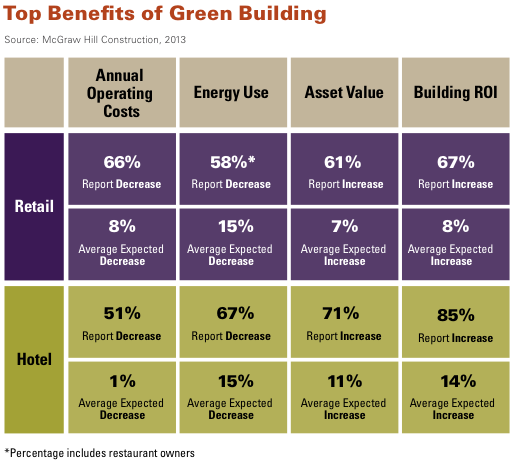 Green building hasn’t always been a good investment for the retail and hospitality markets, but growing consumer demand and economic benefits have changed the equation – more than half of all new US projects will be “green” by 2015. Tremendous green growth has occurred in these building sectors, roughly doubling from 2011 to 2013, according to McGraw Hill Construction’s Green Retail and Hospitality SmartMarket Report. Green projects were defined as those built for high resource efficiency, LEED certification, or other nationally recognized green building standards. 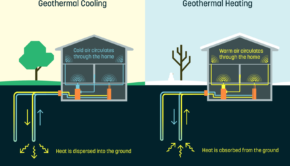 Even though inherent difficulties exist for these markets to go green, especially when compared to the booming residential green building sector, rising asset values and increased consumer demand for green goods are combining with decreased operating costs to make sustainable design and construction the new norm. The growth of green building has been nothing short of spectacular over the past two years. The percentage of retail/restaurant owners reporting more than half their buildings as green jumped from 18% in 2011 to 38% in 2013, and should hit 52% by 2015. In addition, the percentage of hotel owners reporting more than half their facilities as green rose from 28% in 2011 to 48% in 2013, expected to reach 62% by 2015. While these increases are remarkable, they look even better considering why retail shops, restaurants, and hotels have lagged behind other building markets in going green. Unlike the predictable occupants and needs of schools and offices, the retail and hospitality markets must deal with higher HVAC requirements, transient occupants, long hours of operation, and franchise ownership models. Similar to the way rooftop solar boosts home values and resale, green building features are generating serious financial benefits. Asset values increase 7% for retail locations, 12% for restaurants, and 11% for hotels. Building return on investment jumps 8% for retail locations, 12% for restaurants, and 14% for hotels. Interestingly, annual operating costs dropped 8% for retail and 4% for hotels, but increased for restaurants. Energy efficiency was the largest driver of economic benefits for both markets. 58% of retail/restaurant owners and 67% of hotel owners reported lower energy use in their green buildings compared to non-green buildings, with both sectors enjoying a 15% average decrease in energy consumption. Intangible returns, while not as easy to quantify but no less important, also keep piling up for business owners. 46% of hotels that went green reported higher occupancy rates with 69% seeing increased customer satisfaction. In addition, 55% of hotel owners and 50% of retail owners saw an increase in sales velocity, while 69% of hotel owners and 45% of retail owners reported higher customer satisfaction. All of these results track with the 75% increase in US green business sales from 2008-2011. But perhaps more important for these customer service-focused industries, green buildings resulted in happier employees. 62% of retail owners, 83% of hotel owners, and 85% of restaurant owners said green building activities had a positive impact on worker well-being and health. After all, who wants to call out of their shift when they get to work in a naturally lit, efficient, and healthy space? Even though the economic and reputational benefits of green building are clear for a majority of retail and hotel owners, significant obstacles remain for the industry. 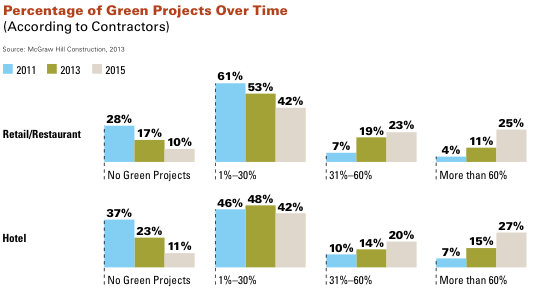 Nearly half of building owners in both sectors said perceived higher up-front capital costs prevented sustainability projects from moving forward, and more than a third reported greenwashing concerns about their projects could limit green activities. 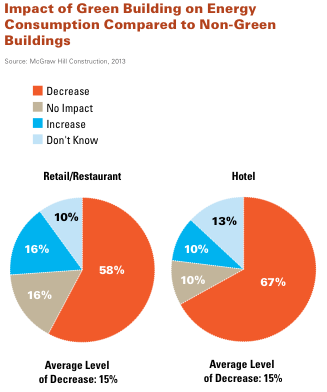 Despite these challenges, McGraw Hill sees significant opportunities for retail and hotel building owners. After all, the survey was conducted among owners, operators, and developers of businesses that had conducted at least $5 million in projects during 2010, 2011, or 2012 – clearly the kind of people who know how to succeed in the retail and hospitality industries.